Ho'omaumele.com is dedicated to becoming your hub for traditional Hawaiian songs, contemporary Hawaiian songs mostly in the Hawaiian Language and Hapa Hoale songs. The collection of content uploaded to this site and links to Internet resources is created and maintained by you. Help make this the best resource for Hawaiian Mele on the Internet. 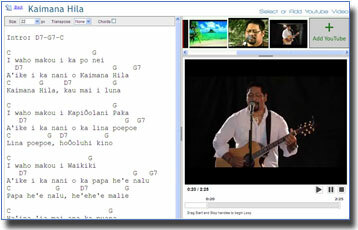 [with uploaded Sheet Music] Text based sheet music that has been uploaded to Ho'omaumele.com. the chords in the song and the format can be customized for printing.